Hamas angry after PA releases American citizen who had been sentenced to life imprisonment for transferring land in Jerusalem to Israelis. 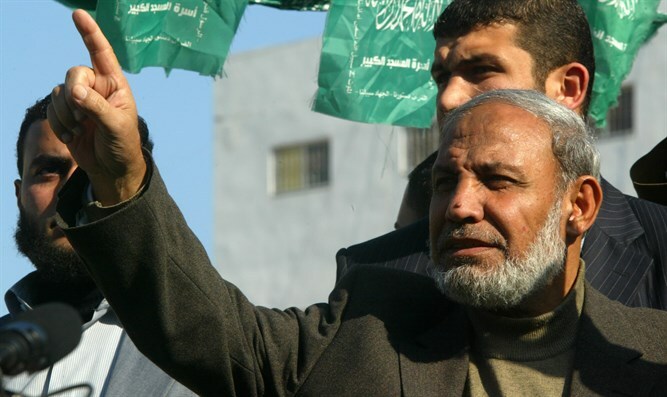 Hamas politburo member Mahmoud al-Zahar on Monday attacked the Palestinian Authority (PA) for releasing an American citizen who had been sentenced to life imprisonment for transferring land in Jerusalem to Israelis. Zahar called the Palestinian Authority's decision "a crime and a severe national betrayal that requires punishment." In an interview with the Felesteen al-Yawm website, which is affiliated with the Islamic Jihad terrorist organization, Zahar said that the decision on this issue shows once again that the Palestinian Authority is "an agent and a tool in the hands of the Israeli occupation." "The land of Palestine will only be sold to its owners, and there is no permit to sell it to enemies and traitors," he said. "Allah will sooner or later avenge all those who betrayed Palestine."